Before you panic and rush out to buy a travel system, there are a few things to think about. We’ll help you sort it all out, including reviews of some of the best car seat stroller combos on the market for 2019. Three wheel stroller-car seat combos can be easier to navigate and weave throughout tight, cramped spaces. They are recommended for families that live in bigger cities and will have to walk through crowds and narrow passages. They also tend to be more compact for easier storage on subways, cabs, and small apartments. The downside is they don’t have as much storage space underneath nor are they quite as sturdy as other models. Four wheel stroller-car seat combos are the sturdiest of travel systems, built for people who will take their children on many playdates and trips that cover longer distances and bumpy terrain such as parks, zoos, etc. They usually have a lot of storage space underneath as well as parent cup/key/cell phone holders up top. The downside is they tend to be more bulky than other models. So fellow passengers might give you the stink eye on the subway if you’re trying to board with one of these. Jogger car seat stroller combos are built sleek and slim so that parents can exercise and keep an eye on the baby. These typically have a more compact design than other models and larger wheels with more tread and better suspension. They also tend to be lighter. You won’t get the bells and whistles with this one like with the 4-wheel models, but you will get the ease of maneuverability that you get with a 3-wheel system. And it might even tempt you into exercising more. A double stroller with infant car seats helps with transporting two children of different or similar ages at the same time. You can personalize this to fit your needs. Parents of twins or two toddlers should really consider this combo! If you’ve ever chased two toddlers who are heading in opposite directions at Disney World, you’ll know why. These are the bulkiest travel systems, but have typically been streamlined to take up the least amount of room possible. That’s the $64,000 question. Picture this: you’re carrying your baby through the zoo in your arms, in an infant carrier or in a sling or baby backpack. None of these are bad ways for baby to travel by any means. He’ll sleep just fine either way. The 3-wheel car seat and stroller combo is a great option for people who want something that is easy to maneuver through tight spaces and doesn’t take up as much room. They’re perfect for attending outdoor events or for everyday use in running errands, especially if you live in a city and often walk or take public transit. The sleek look and slim design make it perfect for walking down streets, in parks, or even throughout buildings. The only downsides are that they don’t offer as much stability or storage space as some 4-wheeled models and can be a bit more expensive. Another thing to note is that you are going to get basic colors and designs here – very few character-themed travel sets come with 3-wheeled car seat and stroller combos. In the end, the 3-wheeled models are rather utilitarian, but they get the job done. The Britax B-Lively and B-Safe 35 travel system is a car seat and stroller combination that is convenient for infants and children up to 55 pounds. It features the B-Safe 35 infant seat with a weight range of 4 - 35 pounds. Your baby can ride in the stroller alone once she’s sitting up by herself. The stroller itself measures 40" L x 24" W x 39.5" H (unfolded); and 29" L x 23" W x 10" H (folded). The stroller is 20 pounds and the car seat is 19 pounds with base and 10 pounds without the base. This system comes in 3 colors - cardinal, dove, and raven. A one-handed fold design and lightweight aluminum frame make the stroller fairly easy to carry. First time parents appreciated the level indicators on the seat base so they could easily tell if the angle was good during installation. The seat clicks easily onto the stroller as well. The canopy offers good SPF 50+ sun protection, and there’s a mesh peek-a-boo window to keep an eye on baby. The braking system felt a little awkward to some parents, especially when wearing sandals. You press it down with your foot to engage, but have to lift it up to disengage. One parent felt the wheels were a bit too small for uneven terrain. The carrier fabric lacks some breathability, so your baby could get sweaty in hot weather. Chubby babies or those who are on the high side of the growth chart may feel too cramped in this seat. There are no solid cup holders included, but pockets which can hold a cup, phone, keys, etc. You can buy a separate organizer with cup holders to add yourself. The stroller fabric is spot clean only. While this system isn’t cheap, it’s not as much as some of the competitors. The stroller itself might be a better investment than the car seat, since your child may outgrow the seat before they reach the weight limit. If you buy a car seat adaptor, you can easily attach another brand of seat to the B-Lively stroller until your baby is ready to sit up on her own. This special edition features the B-Safe Ultra infant car seat w/ base, a B-Free stroller, and adapters. The stroller is slightly heavier and larger and can hold a child up to 65 pounds (10 pounds more than the B-Lively). Unlike the B-Lively, the handlebar on this stroller is adjustable. The seat has a European style belt guide for a secure installation without LATCH (great for rideshares & taxis!). Cool mesh fabric keeps this seat cooler than the B-Safe 35, and it has extra padding in the belly area for extra comfort. The Chicco Viaro is a sportier model, one that fits in with your active lifestyle in style. It includes the very popular Chicco KeyFit 30 Infant Car Seat, which topped our list with a 9.9 rating. It holds infants from 4 - 30 pounds. The stroller holds infants and children up to 50 pounds. The stroller’s open dimensions are 38.0” L x 25.5” W x 41.25” H. Folded dimensions are 13.5” L x 25.5” W x 33.25” H. The car seat is 22” L x 17” H x 24 “ W.
The stroller alone weighs 18 pounds. The car seat weighs 7 pounds without the base. The system comes in 6 color combinations: coastal, cranberry, oxford, teak, techna, and verdant. This is a lighter model, especially for Chicco. The car seat itself is also on the lighter side, making it great for people who have to do a lot of switching between cars and stroller. The car seat cover is easy to remove and machine washable. The double front wheel and lightweight frame of the stroller makes for better maneuverability. You can fold it with one hand for compact, free-standing storage. Parents really like this one for airline travel. A parent tray with two cup holders helps you keep water or coffee at hand for any time of day. There’s also a two-cup child tray with a snack compartment for when baby’s ready to ride without the car seat. The storage basket underneath is pretty roomy for a 3-wheeled model. Some parents had issues with the stroller seat reclining enough to be comfortable for their child. A few noted that the cup holders on the parent tray weren’t big enough to fit larger water bottles. Assembly proved to be difficult for some at first. Some parents didn’t like that the child tray had to be on and the stroller fully reclined in order to attach the car seat. Overall, this is a really good travel system. 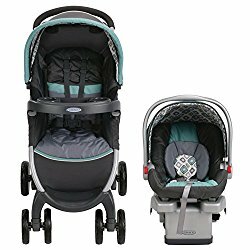 The car seat is probably the better investment so if you wanted to make a custom combo, you could purchase a Chicco KeyFit stroller frame (does not work as a stroller alone). The seat is also compatible with several other stroller brands such as Baby Jogger, BOB, Britax, Bugaboo and more. You may need a car seat adapter in order to use some of those, however. This sporty model from Graco includes the Graco SnugRide Click Connect 35 infant car seat, which rated 9.2 in our infant seat reviews. The car seat holds infants from 4 - 35 pounds, while the stroller holds infants and children up to 50 pounds. The car seat weighs 7.5 pounds without the base, with dimensions of 30.7” in depth, 18.7” in width and 15.6” in height. The stroller weighs 21.4 pounds. It’s folded dimensions are 16” L x 25” W x 28” H. The system comes in 4 color combos: boden, gotham, ottawa, and pierce. Besides the top-rated SnugRide Click Connect 35 infant seat, this stroller has a one-second, one handed fold that makes it super quick to transfer into the car after a fun outing. The seat of the stroller has multiple recline angles for baby’s comfort. Extra deep cupholders in the parent tray hold many sizes of travel cups and bottles. The seat covers are machine washable in cold water (hang to dry). Great suspension and a big storage basket makes for a smooth ride with everything close at hand for baby’s needs. The pivoting child tray makes it easy for your toddler to get in and out of the stroller. Parents appreciate the affordable price and easy assembly. Some parents found unfolding the stroller to be somewhat difficult. Adjusting the stroller seat recline also proved challenging, particularly when the baby was already in it. One parent noted that it’s easy to accidentally engage the wheel locks while walking with the stroller. The storage space was also a little too small for large diaper bags. A few parents had issues with the car seat in getting it out of the base, while others also found it hard to attach securely to the stroller. There were also a few quality control issues noted when unboxing such as a missing seat base, and a loose front wheel. Besides a few quality control issues, this system is a good option for most families. It’s reasonably priced and performs well for the vast majority of parents. Be sure to thoroughly inspect all parts any time you purchase a car seat or travel system. If anything is missing or broken, contact the seller or manufacturer immediately. 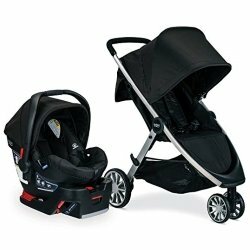 The Baby Trend Nexton travel system is a good option for those on a tight budget. It features the Baby Trend Flex Loc infant car seat. The car seat weight range is 5 - 30 pounds. You can fit a 4 pound preemie in there as well with an extra infant insert. The stroller holds infants and children up to 50 pounds. Folded stroller dimensions are 40.5” L x 12.3” W x 25.3” H. Unfolded dimensions are 46.5” L x 22.5” W x 44.5” H. Car seat dimensions are 26” L x 16.5” Wx 25” H.
The weight of the entire system is about 35 pounds. The car seat alone weighs 9.5 pounds. There are at least 3 color combos, including coral floral, mod dot and phunk plaid. Parents love the infant carrier handle with its easy rubber grip and unique shape. Assembly of the stroller was super easy. An expandable canopy with a mesh window make it a great option for people who live (or travel to) sunnier climates. For older children, there is a removable, washable child tray that many like. The stroller seemed easy to push and maneuver with the swiveling front wheel. The car seat base has several adjustments so newborns have the proper angle for their heads. Taller parents appreciate the adjustable stroller handle. Many parents really love the cute colors and patterns and got several compliments about it. There’s a covered compartment in the parent tray to keep your cell phone, keys, etc. out of sight and dry. Some parents found the instruction manual to be really hard to follow. Others couldn’t adjust the car seat angle enough to support the baby’s head. Some found the parent cup holders too narrow and the child cup holders too wide. A few parents reported that they couldn’t get the car seat base installed securely enough, even with help from police officers, etc. This could be due to vehicle incompatibility. A few also found the car seat difficult to attach to the stroller. Overall, customers have been very happy with this system. Vehicle compatibility could be an issue for installation and recline angles. Call the manufacturer to see if they know whether your particular vehicle would be compatible before you purchase this system. The stroller alone weighs 18.4 pounds. The car seat without base weighs 8.7 pounds. The system comes in 4 color combos: houndstooth, paisley, mums, and circle stitch. Parents with multiple car seats said this one fit well in a 3-seat configuration. On a really positive note, the car seat has performed well in at least one customer-reported crash involving a 2-day-old infant. She was completely unharmed. Some parents felt that the actual stroller was heavy and hard to turn. It doesn’t seem to roll well on loose or rough terrain but does better on flat surfaces. Others have had problems folding and unfolding the stroller. Some parents noted problems with the wheels either squeaking or coming loose. Several parents thought the car seat doesn't recline enough for their babies when in the car. Also, this system was first manufactured a few years ago, so be sure to check for any recalls before purchasing in case you get an older one. Overall, parents are happy with this system budget-wise. They also love the colors/design. It’s good for your everyday, flat terrain walking, but if you want something for rougher areas like unpaved trails, you should look elsewhere. However, these tend to be a bulkier and can take up more room in your car or closet. Four wheels also make it a little harder to move “on a dime,” so they aren’t always the best for navigating through crowds or within tight quarters. They’ll also be more challenging to store on a plane or on public transit because of their bulk. 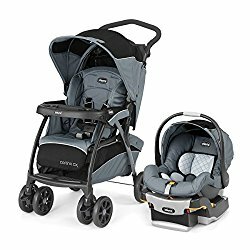 The Chicco Bravo Trio is a car seat stroller combo that features the top-rated Chicco KeyFit 30 car seat which can be used for babies from 4 - 30 pounds. The stroller is for babies and children up to 50 pounds. Stroller folded dimensions are 16” L x 28” W x 21.8” H. Car seat dimensions are 17” L x 27.5” W x 24” H.
The car seat weighs 9.6 pounds without the base. The stroller weighs 23 pounds. This system comes in 4 color combos: lake, lilla, orion, and papyrus. 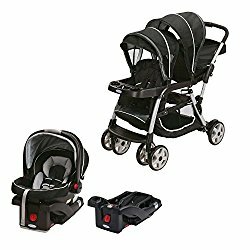 This car seat and stroller combination is lightweight, folds and unfolds easily and quickly, and has a lot of storage space, including a large storage basket and parent tray with two cup holders. It’s lightweight with the car seat because you remove the actual stroller seat, attach an adapter, and then add the car seat. As you fold it up, the front wheels rotate inward to ensure a more compact, free-standing storage. A height-adjustable push handle fits parents of all heights. All fabrics are machine washable (hang to dry). The stroller itself is extremely comfortable for the baby, thanks to the large canopy and medium size wheels. Some parents had problems with the maneuverability of this stroller. It can be difficult to turn the stroller at times. Others had issues with loose or squeaky wheels that made it hard to steer. You may end up picking up the back wheels to turn instead of turning gracefully. As far as the car seat, some had issues getting the correct angle when installing without the base. Others found the car seat didn’t always snap securely into the base, even when a click was heard. Some also reported that the seat fabric didn’t breathe well, leaving their babies sweaty. Overall, this is a great combo, if only for the Chicco KeyFit 30. The included adapter allows you to use any KeyFit and Fit2 car seats with the stroller. So if you wanted to use a KeyFit 30 Magic car seat with the improved canopy, you could easily do that. This trendy-looking system features the Maxi Cosi Mico 30 infant car seat. The similar Maxi Cosi Mico AP scored 9.1 on our list, but has a 22 pound weight limit as opposed to the 30 pound limit in the Mico 30. The stroller holds babies and children up to 50 pounds. Folded stroller dimensions are 17" L x 25.5" W x 34" H while unfolded dimensions are 37" L x 25.8" W x 45" H. The car seat dimensions (with base) are 32.5" L x 17.75" W x 22.75" H.
The stroller weighs 21 pounds by itself. The car seat without base is 8.6 pounds. It comes in 3 fashionable colors: emerald tide, night black, and violet caspia. People love this stroller for a variety of reasons, including the design, the accessories, and the placement of certain features. Most parents love that it’s so lightweight. The 5-in-1 features are what makes this one truly unique. The stroller seat is reversible, so you can use it as a traditional baby carriage with full recline to keep a close eye on your baby while she naps. Or turn it around so she can see the world. Other nice features are extra padding that can be added to the stroller for more napping comfort. Premium fabrics are self-wicking to help keep baby dry on hot summer outings. 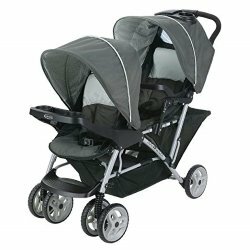 A self-standing fold, height adjustable handle, large canopy with flip-out visor and peek-a-boo window and ample storage make this a comfortable and efficient ride for parents and baby. This system isn’t cheap, so those with a tight budget may want to look elsewhere. Some parents felt the stroller seat was too small and wouldn’t last through the 50 pound limit. Others felt the stroller was actually TOO lightweight to be sturdy while putting baby in and out. Some felt that the car seat was too difficult to attach and unattach to the stroller. A few felt the wheels and handle were flimsy and felt loose. Overall, this is one case where you get what you pay for. While relatively expensive, there’s a lot to love about this system. It’s not only stylish, but versatile. There are a few flaws, but if your budget can handle it or you can find it on sale, this is definitely a contender. 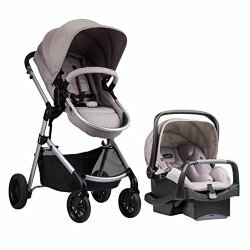 The Chicco Cortina CX Travel System is a fantastic travel system that also includes the Key Fit 30 infant car seat, which comes with many great features as well - EPS lined shell, single strap LATCH installation, and built in lock offs for the belts. This stroller is quite a bit larger than the Bravo Trio. Stroller unfolded dimensions are 34.3” L x 20.8” W x 44” H. Folded dimensions are 42” L x 21” W x 20” H.
The stroller is good for babies and children up to 50 pounds. The stroller weighs 23 pounds, and the car seat weighs 9.6 pounds without the base. It comes in one color combo - iron, a nice gray and black pattern. One of the most unique features is the memory recline option - the stroller seat goes back to where it was before you folded it. It’s a great option for parents who have children who are only comfortable in one position - like colicky babies. The child tray also swings out easily so your toddler can get in and out by herself. The removable child tray liner is dishwasher safe for easy cleaning. The stroller fabric, though washable, is difficult to put back on. A few parents felt the quality has declined on the stroller, with flimsier wheels and handle. Most parents are happy with this system. It’s lightweight and sturdy, easy to maneuver for its size. But the size could be an issue if you have a small trunk or hatch. Measure your car storage space and compare it to the stroller dimensions before buying. This system is a great option for families on tight budgets who don’t need a ton of features. It includes the Graco SnugRide Click Connect 30 infant car seat. The similar Graco SnugRide 35 rated 9.2 on our list. As for the weight and height limits, the car seat fits babies from 4 pounds to 30 pounds and no more than 50 pounds for the stroller. Unfolded dimensions of the stroller are 27.5” L x 41” W x 22” H. Folded dimensions are 28.5” L x 18.5” W x 22.5” H. Car seat dimensions are 26.7” L x 17.5 W x 24.2” H.
The stroller weighs 22 pounds. The car seat weighs 7.5 pounds without the base. When you add the base, it comes in at just over 14 pounds. This system comes in 3 color combos: affinia, finley, and nyssa. The stroller is lightweight and easy to use, with a FastAction fold that parents really appreciate. It is simple enough that you can fold it with just one hand. 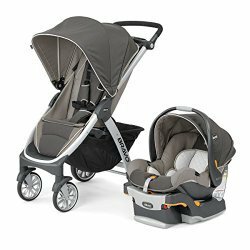 This Graco stroller combo also works with many different varieties of Graco car seats, so you can mix and match as needed. Multi-recline angles help your child rest comfortably in the stroller. An extra-large storage basket and parent tray keep all your essentials at hand. The child tray pivots out so your toddler can get in and out easily. The car seat cover is machine washable (line dry). Some parents had problems with the canopies of both seat and stroller. They didn’t close together well. Others found when folded, the stroller seemed awkward and upside down. Some had trouble opening it with one hand. A few parents noted that the stroller seemed very hard to turn once their children were over 35 pounds. Parents who use the Graco Fastaction Fold Click Connect really like the “fast action” part of folding/unfolding. For parents who don’t have a lot of time, who are on a budget, or those who are constantly going from car to stroller, this is a great option. For those who have a child that’s high on the growth chart, you may want to look elsewhere. The Evenflo Pivot Modular Travel System features the Evenflo SafeMax infant car seat, which scored 9.6 in our infant seat ratings. This one is unique in that it’s available with several accessory options for a customizable package. Car seat dimensions are 29” L x 17.5” W x 24” H. Assembled stroller dimensions are 25.5” L x 34” W x 47” H. The car seat carries babies from 4 - 35 pounds, while the stroller’s maximum weight is 50 pounds. The stroller weighs about 22 pounds. The car seat weighs about 7 pounds without the base. It comes in 4 colors: navy, dusty rose, sandstone, and casual gray. The Evenflo Pivot system is a multi-functioning system that has 5 modes of use. A reversible carriage mode with 2 options, frame stroller, travel system, and toddler stroller. New cruiser tires offer a smooth ride. The whole system, including the car seat/infant carrier, is really lightweight and easy to carry or maneuver on most flat surfaces. Parents appreciate the stay-in-car SafeZone base with anti-rebound bar. The included bassinet works like a regular pram-style stroller and is also very comfortable for baby to sleep in. While not recommended as a permanent bed, parents say it’s a good travel bassinet. Some parents had issues getting this one to maneuver well on anything other than pavement. Quality control problems were the most common complaint, with several parents finding broken or missing parts when they opened the package. A few parents thought the rear wheels were too wide, so they tended to get stuck in doorways, etc. Some parents had a hard time attaching/detaching the car seat to the stroller. Others found the wheels didn’t turn or steer properly, either getting stuck or tending toward one side or the other. Overall, parents either love this one or they don’t. It’s kind of a middle of the road system in terms of price and performance, but the seat is the star of this show. As with any product, inspect all parts immediately after you get it. Don’t let the package sit and risk being too late to return or get a refund. The Italian-made Peg Perego Booklet Travel System is a high-end car seat stroller combo. It is a simplistic yet classy design that features everything parents need to keep their child comfortable and safe while on the go. It features the Primo Viaggio 4/35 infant car seat, which scored 9.5 on our list and holds babies from 4 - 35 pounds. The stroller holds babies and children up to 50 pounds. Stroller unfolded dimensions are 38.5” L x 21.5” W x 40.8” H. Car seat dimensions with base are 28.5” L x 17.25” W x 26.5” H.
The Viaggio 4/35 car seat weighs 10 pounds without the base. The stroller itself weighs 19.6 pounds. The system comes in a couple of colors: atmosphere and onyx. Parents love this model because it steers easily, even one-handedly. They also love the roomy basket, which pulls down farther to fit larger items. The stroller is compact when folded, enough to fit through an airport x-ray machine, so it’s great for travelling and carry-on. The large canopy with extendable panel and peek-a-boo window has UPF 50+ sun protection and closes completely over baby when using the car seat canopy as well. There’s even a flap on the stroller seat back that you can lift to provide a mesh ventilation system to keep your child cooler in hot weather. This is an expensive travel system. High quality, no doubt, but families on a budget might want to look elsewhere or wait for a sale. It’s disappointing in terms of extras as well. With no parent tray and the child tray as a separately sold item, it’s rather lacking for the price. Hard plastic tires, stiff suspension and little seat padding mean this travel system isn’t as comfortable a ride as some of the competition. Overall, for parents who can afford it, this is a high quality travel system. However, that’s about it. There’s not much to hate about it, but there’s not much to get excited over either. We recommend watching for it to go on sale. For parents who are looking to get back into shape after having a baby, a jogger stroller and car seat combo helps you burn calories while taking your baby along. These are usually very sturdy, lightweight strollers that can move quickly and maneuver well over bumpy terrain. They can be more expensive than other models, which is something to think about. Be aware that not all “jogger” strollers are made for jogging. For instance, there’s a brand called Baby Jogger with several strollers, but there’s only ONE of their strollers actually approved for jogging. Note: Most manufacturers recommend NOT running with your baby until they’re at least 8 months old and can hold their head up without help. Jogging strollers are designed for one specific purpose and aren’t meant for long outings. For jogging, you may not be able to use it like a travel system (with the car seat) in some models. You’ll probably want to invest in either a 3 or 4-wheeled system as well, so you’ll have a more heavy-duty, roomier ride and more storage space for trips to the zoo and park. However, many parents use these as their sole stroller simply because they’re better on rough terrain. We’ve combed through the best models to determine which ones will get you the most bang for your buck so you can get fit while keeping your little one safe. The Graco FastAction Fold Jogger features the Graco SnugRide Click Connect 35, which scored 9.2 on our list. The seat is designed for infants 4 - 35 pounds, while the stroller tops out at 50 pounds. The stroller is 30 pounds. Folded dimensions are 39” L x 23.6” W x 15.3” H. The car seat weighs 7.5 pounds without the base and its dimensions are of 30.7” L x 18.7” W x 15.6” H. This system comes in 2 color combos: gotham and chili red. Safety and security are the biggest advantages of this model. Air-filled rubber tires and the 5-point safety harness ensures that you can run while keeping your baby still without making them feel constrained or uncomfortable. The pivoting child tray with 2 cup holders and storage for snacks or toys lets your toddler get in and out on their own. There’s a parent tray that parents love as well, with two cup holders for water bottles and a cell phone cradle so you can keep your phone secure while listening to your favorite jogging tunes or podcasts. The under-seat storage basket is big enough to toss in a few extra water bottles, some diapers, and other essentials to lengthen your run. Several parents felt the stroller was too heavy and took up too much room in their cars. One parent noted that the cell phone cradle was too small for an iPhone 6. The stroller may not stand well on its own, either. Other issues involved quality control problems with wheels breaking, getting stuck, or going flat. The wheels are easily punctured with thorny plants or sharp rocks. While not without some issues, this system is a good value for tight budgets. It’s surprisingly heavy and big, so be sure to measure your trunk space before purchasing. 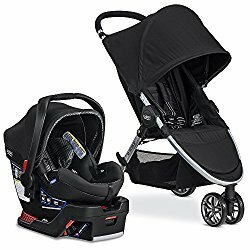 The Baby Trend Expedition is a car seat and stroller combination featuring the Baby Trend Flex Loc 5-30 infant car seat. The car seat is for babies 5 - 30 pounds. The stroller holds babies and children up to 50 pounds. Stroller dimensions are 44” L x 22” W x 46” H. Car seat dimensions are 26” L x 16.5” W x 25” H.
The stroller itself weighs about 26 pounds. The car seat weighs about 9.5 pounds. This system comes in a wide range of 10 colors, from bright to monochromatic. This budget-friendly system maneuvers easily on many surfaces with its 16” rear and 12” front all-terrain bicycle tires. It’s easy to assemble. It’s easy to fold up with two hooks on each side. The rubber bicycle tires help make the ride very comfy for your kiddo. They’ve held up well for those who live in dry climates with thorny plants and sharp rocks. The child tray swivels out so your toddler can climb in and out easily. The parent tray has a covered compartment to keep your keys/phone, etc from flying out or getting wet. Cheaper price means the stroller materials won’t be as long-lasting as other stroller systems and may only last through one child. Wheels may begin to lose air and become loose after some time. Some parents had trouble getting the seat off the base and off the stroller. 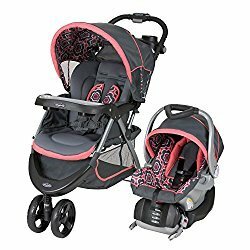 The fabric isn’t very soft and smooth as with other strollers, so it might not be comfortable or breathable for long trips. The covered compartment in the parent tray might be too small for some phones such as the iPhone 6Plus and up. Also, there have been quality control issues with some parts breaking or getting stuck on the stroller after less than a year’s use. For the price, this is a good system, but don’t expect it to last through more than one child. The stroller is sturdy for those who are only going to use it for walking and travelling. For running, it may wear out faster. Always inspect every part as soon as you get it and contact the seller or manufacturer immediately if something breaks. The warranty on this system is also about 180 days, so you may have issues getting replacement parts past that time frame. The Graco Relay model is one of the best for parents who like to pick up some speed when they are running and jogging, especially for those who run hills or sprints. It features the Graco SnugRide Click Connect 35, which scored a 9.2 on our list. The seat holds babies from 4 - 35 pounds. The car seat weighs 7.5 pounds without the base and its dimensions are of 30.7” L x 18.7” W x 15.6” H. Stroller folded dimensions are 20.5" L x 33.5" H x 25.5" W.
With a weight limit of 70 pounds, the stroller has one of the highest weight limits you can purchase on today’s market. The stroller alone weighs 28 pounds while the the build of this model is a little more compact, making it easier for taking onto public transportation or running in areas where there are a lot of people. The system comes in a couple colors: glacier and jaguar. Once again, maneuverability seems to be the biggest selling point of this travel system. 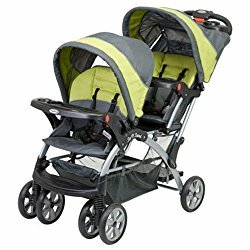 A premium suspension system, pneumatic tires, and a locking front-swivel wheel with tracking keep the stroller smooth and steady when you’re running. High quality fabric is also reflective for better visibility in the dark. The canopy is generous and the whole stroller folds in half for easy storage. Parents appreciate how it can glide over almost any terrain. Some parents have complained about the darkness of the fabric, saying that they felt it made their child sleepy. Others said that when they went over something uneven for an extended amount of time, the bottom basket failed and things were jostled from it. This could be because it is a bit close to the ground. A few parents said the basket wasn’t large enough for anything but a very small diaper bag. Some parents found it to be too heavy and bulky. Others had some quality control issues with keeping the stroller joints locked in place. While not the cheapest jogging system, this is a fairly good value considering the performance while jogging. Some parents actually like the stroller better than the seat. But the good news is that it’s compatible with any Graco Click Connect seat. The downside is buying 3 separate pieces, but it gives you more options for car seats. 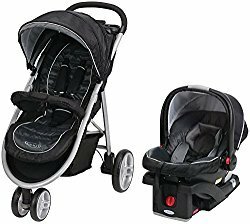 You could also get a travel system we’ve listed here that comes with one of those seats such as the Britax B-Agile for everyday outings, and then this jogging stroller with adapter for more active days. The Joovy Zoom 360 Ultralight is 25.7 pounds and folds almost in half for a more compact storage. The 16” rear wheels and 12.5” front wheel (which swivels for walking & locks straight for jogging). It has one of the highest weight ranges on the market, accomodating a child up to 75 pounds. It comes with a zippered parent compartment with 2 cup holders, a tire pump, and a running leash that attaches to your wrist so your stroller won’t get away from you accidentally. It has quite a lot of storage plus a big peek-a-boo window to keep an eye on your child. Once again, quality control issues with the wheels can be a problem. Wheels can vibrate too much or fall off over time. A few parents had the front wheel falling off while jogging, resulting in minor scrapes for their children. 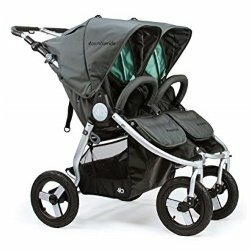 We cannot stress enough with every stroller - ALWAYS inspect the wheels thoroughly before every jog and do not use if anything is loose or broken until you get it replaced or tightened. Since you’re putting jogging strollers under more stress than a normal walk, they will suffer wear and tear more than a regular stroller. 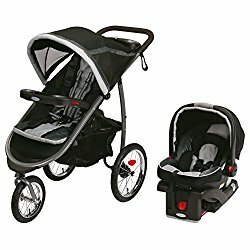 This is an affordable jogging stroller that is compatible with several high-rated car seats (with the proper adapter). If you’re okay with buying separate parts, this gives you a little more control for managing your budget and not being stuck with one set you may not like. The great thing about double strollers is that it’s easy for one person to push them, but they can also be pushed by two people comfortably. One obvious downside to a double stroller is that they can be heavy and wide (depending on design) and aren’t the easiest to push through busy areas. They’re much better suited for wide outdoor spaces like paved zoo paths where you won’t be on crowded sidewalks or having to go through narrow doorways. They’re also bulkier than single strollers, so they will take up a considerable amount of trunk space. There aren’t a lot of these combos on the market, but we’ll show you a couple of options that fit our top-rated infant seats as well. We’ve researched the best models to determine which ones will get you the most bang for your buck so you can take two littles for a ride. 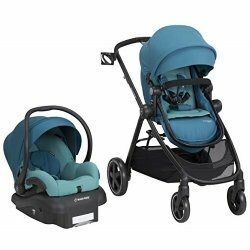 The Graco DuoGlider Click Connect Double Stroller is by far one of the most popular models of double strollers on the market today. It is a user-friendly model that can hold two children of different ages and is compatible with all Graco SnugRide Click Connect infant car seats, including the Graco SnugRide Click Connect 35, which rated 9.2 on our list. It only comes in one neutral gray/black color. This stroller accepts 2 Click Connect infant car seats. It holds two infants and/or children up to 40 pounds each. It has a one-hand fold and stands on its own for easy storage. A drop-down storage basket lets you access essentials without disturbing your child. Quite a few parents have mentioned that there is a bit of a learning curve with this system. It might take a few days before you feel comfortable enough with it to move for long distances. Others didn’t like that there were no shoulder straps, only lap belts (3-point harness), on the stroller seats. There may be some quality control issues with the wheels. Axles may bend under the weight of two kids. Wheels may jiggle after a couple months of use. Taller toddlers may have legs that are too long to be comfortable. The child trays need to be removed before you attach car seats, which may not be clear in the manual. Overall, parents like this stroller, once they’re used to it. It’s definitely affordable, and since it’s compatible with any Graco Click Connect seat, it’s easy to customize to your liking. The Sit N Stand is great for people who have children of different ages, but it can work for twins as well. It’s compatible with Baby Trend Flex Loc infant car seats and several other brands. The stroller weighs approximately 32.5 pounds. Dimensions are 49″ L X 21.5″ W X 43″ H. It comes in 4 color options: carbon, elixir, millenium, and stormy. Maximum weight should not exceed 40 pounds per child. The rear standing platform is for children over 2.5 years old and below 40 inches high. One of the biggest advantages that this stroller car seat combo has over other models is that it offers something for children who may be too big to sit comfortably in a regular stroller seat - a jump seat or standing platform. It still has the options of two regular stroller seats or two car seats. A covered parent tray with two cup holders and extra large storage basket keep all your essentials at hand. The seats do have 5-point harnesses, which many parents felt made it safer. Parents liked that there are handles on the side of the front seat which help you pull the stroller through a door when you’re by yourself. Parents found it fairly easy to turn. Parents noted a learning curve with this system. Closing it can be a challenge since the wheels must be facing a certain way. Some parents couldn’t push it well on loose terrain or snow/slush. The storage basket can be hard to reach from the rear and may need to be accessed between the seats. The front canopy is a bit short and doesn’t provide as much sun protection as some parents had hoped. To use other brands of car seat, you may need to use an included strap since they won’t click in like the Baby Trend seats. Taller children may be too tall for the front seat, causing their feet to drag the ground. For many parents, the Baby Trend Sit N Stand Double Stroller is a great option for a great price and the versatility of seating and age ranges. The stroller weighs 23.5 pounds and folded dimensions are 30” L x 30” W x 11” H. It holds up to 100 pounds (50 pounds per seat), which is about the highest maximum weight you can find in any stroller. Several accessories are also available to purchase separately. The pull-to-fold strap makes folding and picking up a lot simpler, even though it’s not a super light stroller. Parents appreciated the ForeverAir tires that don’t need inflating, which is great if you’re on vacation and have no access to a tire pump. It’s narrower than some double strollers when unfolded (29”), so a bit easier to turn and maneuver through tighter spots. This version has updated the harnesses from the earlier 2013 models so it’s quicker and easier to snap together. Children who are high on the growth charts fit this model better than others. The handlebar adjusts for parents of different heights. Note: Unlike the brand name might suggest, this is NOT a jogging stroller. Some parents had difficulty getting some of the car seats to attach, especially the Graco models. The basket is pretty small with a bar in the middle that makes it hard to store a normal size diaper bag. The suspension is lacking, so rough terrain will make for a bumpy ride. Parents were also unhappy that the stroller isn’t compatible with more brands such as Chicco and Britax. Some parents noted that the seats didn’t have enough recline when sitting fully upright, and that their children tended to slide down. There also seems to be a tendency for tipping over if a child stands or climbs into the seat with their knees. 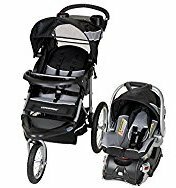 Despite the price and somewhat misleading name, this is a good double stroller that many parents are satisfied with. If you already have some of the compatible seats, it would be a good investment. The stroller weighs 36 pounds and folded dimensions are 32.5”L x 29.5”W x 12”H. It can hold a maximum of 90 pounds (45 pounds per seat). It comes in 6 fashion colors such as dawn grey mint, maritime blue, camp green, matte black, dawn grey coral, and tourmaline wave. This premium side-by-side stroller has many premium features you can’t find in cheaper strollers. True all-wheel suspension (not just front wheels), oversized UPF 45+ canopies with extensions, soft rPET polyester fabric made from 53 post consumer water bottles per stroller, and certified free of harmful chemicals. Adjustable foot rests keep little feet supported for no more dangling legs. Newly upgraded in 2018, this stroller has more headroom per child and more sun coverage. Parents love the smooth ride and how easy it is to fold and transport. They found it fairly easy to fit through most doors and aisles. A zippered compartment on the back stores cell phones and keys and can be removed for extra air flow. A large storage basket holds big diaper bags and purses. It’s expensive! This is no cheap stroller by any means. There are no cup holders. The only accessories included are a tire pump. All others are sold separately. Older versions had less headroom per seat, so toddlers’ heads often touched the top well before they outgrew the weight limit. The new version should be better with the upgrades, but keep that in mind when shopping. This new version also has limited colors available, so if you’re dead set on blue, you may be disappointed unless you opt for the older version. The price alone may deter many families. However, there are very few quality control issues with this model. For the investment, you’ll most likely end up with a high quality product that will last a long time. 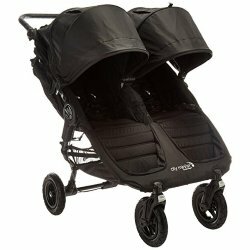 What do I look for in a travel system? Purchasing a travel system means that you will also be purchasing an infant car seat. Unless you have another dedicated seat for the car, the car seat part of your travel system is the most important part to consider. Your child will most likely spend more time in the car than the stroller, so look for a travel system with a car seat that has a higher weight limit (35 + pounds). The seat should be highly rated and really easy to install in the car. In just a few short months, your baby will be sitting up on her own and ready to ride in her stroller without the car seat. Since the usual stroller should last until your child is 50 or more pounds, you’ll want one with good suspension and easy maneuverability. A sleeping 3-year-old can often feel like they weigh a ton, so you want something you can push around easily without breaking your back and waking her up. The stroller should also be easy for your toddler to climb in and out of without having to be picked up. Snack trays and parent trays with decently sized cup holders are a real lifesaver for long outings. You don’t want to be stuck in the zoo on a hot summer day with no good place to store water for both of you. Having it right at hand will be very convenient. Of course, there’s always the chance she’ll play the “drop the sippy” game, but that’s where a second parent cup holder and extra storage baskets on the stroller can save the day. Besides your budget, one of the most important aspects of knowing which travel system to buy is your lifestyle. Do you rarely leave the house? Do you live in a city or in a suburb or way out in the country? Do you enjoy hiking or jogging or just simple strolls around the neighborhood? Do you fly or use public transit or ride shares a lot? Do you have twins? Look for a system that fits your lifestyle, whatever that may be. Will buying a travel system save a lot of money? When you are doing research to find the perfect carseat-stroller combo, of course the most important thing is safety. You’ll want to pay particular attention to the car seat portion of the combo, as your baby will spend more time in the car than the stroller. Car accidents are still a leading cause of injury and fatalities in young children, so it’s vital to ensure they’re in a good safety seat. But money is still an important factor for most families. If you buy your car seat along with a stroller in a travel system, it can save you some money. For instance, a Peg Perego Primo Viaggio 4/35 car seat is about $300 alone. The Peg Perego Booklet stroller is about $350. Buying them together in the Peg Perego Booklet Travel System is about $600, so you’re saving at least $50. That might not seem like much, but every dollar saved can really help when you need to buy essentials like diapers, baby food, etc. Price. How much do you want to pay? A car seat stroller combo is going to cost you more than buying one of those items individually, but that might not always be the case. Compare the price of each item individually to the the price of the combo to see which will save you money. Type of seat. There are two types of seats for infants: convertible seats and rear-facing seats. Convertible seats can often last through the time your child no longer needs a safety seat, which can save you money. But they don’t work as infant carriers and therefore will not attach to a stroller. Think about getting a convertible to stay in the car and a separate travel system so you’ll have an infant seat for the stroller. Then you’ll also have an extra seat for grandma, babysitters, etc. Ease of use. Read reviews to see which car seats are easiest to use. This, in our opinion, is the most important factor for safety. A car seat that is difficult to install or use increases the chance of a malfunction. Look for a travel system that includes that seat. The stroller should ideally be easy to unfold/fold, easy to push, and easy to attach/unattach a car seat. Custom combos. Sometimes a custom combo is the way to go, especially if you already have a car seat you love but need a stroller to go with it. Many brands like Graco and Britax have strollers that are compatible with several of their seats. Or you can often purchase a car seat adapter so your car seat will fit on a wide variety of strollers. 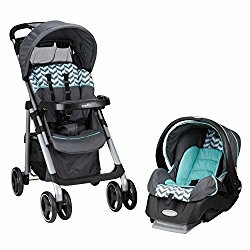 Example: the Joovy Zoom 360 Ultralight Jogging Stroller can be used with a LOT of different car seats if you buy a specific car seat adapter. Can I reuse the stroller portion? In general, you can reuse the stroller portion of your travel system. While most people don’t suggest that you reuse the car seat portion because the quality of it degrades over time, there is generally less wear and tear on a stroller. Most of the support, comfort, and safety features are actually included in the car seat itself. The stroller is just more of a base, but ALWAYS check all parts, wheels, etc. regularly to make sure none of them need replacing. For parents who are truly on a budget, they will just buy a system from a brand name that they trust and then keep buying compatible car seats as each child comes along. Bigger name car seats and stroller combos are more likely to have several compatible seats and available replacement parts. But don’t overlook smaller brands, as they may also have better customer service. Note that just like other pieces of equipment, the stroller does have an expiration date. Try to replace strollers a few months before they expire in order to give yourself time to search. When choosing your baby travel system, you should look for the type of auto seat that you want first. Some will work with strollers. Others won’t. Infant: These are for newborns up to at least 2 years. They have a harness and seat that cradles your child, protecting the spinal cord and neck. You must use this seat in a rear facing mode. Most infant seats can be used with strollers. Now, once you’ve chosen the type of seat that you want, you have to choose the type of stroller you want. Travel systems: Travel systems combine the car seat and stroller for a smoother ride but a shorter lifetime as your child outgrows it. Prams: This is a trendy style today that was the only style years ago. It has oversized wheels and a larger, covered bed for your baby. This is only meant to be used for newborns. Seat carriers: Probably the easiest of all strollers, this is a metal or plastic frame that holds the baby car seat. There are many models available under this category. Jogger strollers: For parents who love to work out, this one allows you to run without jostling your child. 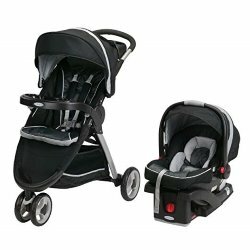 What are the alternatives to an infant car seat stroller combo? There are alternatives to a travel system, like a baby carrier. However, the carrier is not as stable nor comfortable for the baby and quickly gets heavy for parents beyond short distances. Another option would be a stroller with a bassinet (pram), but these tend to be bulky and too big for everyday use and aren’t good for toddlers. For small infants, there are slings and wearable carriers and backpacks that will keep the little ones close. Slings can pull double duty as a nursing cover as well. Babies will feel secure tucked up next to mom or dad. But mom or dad may suffer back pain after some time. Have you found a travel system you love that’s not on our list? Comment below and let us know about it so we can check it out and possibly add it to future listings. Hi – if you could recommend one combo system that is highest safety, has the bassinet option, is super comfortable for baby, and is easy to use, what would it be? 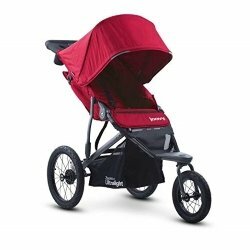 Considering the Peg Perego, but would like advice on alternatives. Hi Thomas, thanks for your question. You may want to look at the Maxi-Cosi Zelia 5-in-1 system. At only 21 pounds, it’s super light, but very versatile. It has 5 different modes, including a carriage mode that fully reclines like a bassinet for naptime. And it’s reversible so you can have baby facing your or facing out. The Evenflo Pivot is another similar option, and it’s also more affordable. Can you link the Peg Perego. I’m wanting one exactly like that, that grows with baby. Looked up Peg Perego and got a ton of diff things. Hi Lauren, thanks for your question. Are you asking about the Peg Perego Booklet travel system? 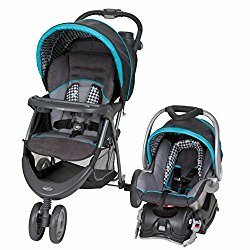 If so, we linked it on our travel system page, so just scroll down and click it there: https://bestcarseathub.com/best-car-seat-stroller-combo-travel-systems/ We did notice a slightly newer version is out now on the retailer’s product page – the Peg Perego 50 Travel System. Also a link to the Maxi? I’m hoping to have it with the infant seat attaching to back of stroller. 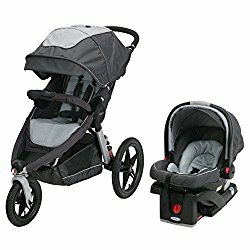 Is there any car seat stroller can fit for 0-2/3 years old? Hi Evelyn, if you want to use both car seat and stroller until that age, you’ll want a car seat that allows for extended rear-facing. The weight of your child may be higher or lower than average. However, the average 3 year old is between 29 and 34 pounds, so if he or she falls within that range, you should opt for a 35 pound or more weight limit for the car seat. Most strollers will carry up to 50 pounds or more, so those should last a good while. Hope this helps you narrow down your shopping list! I’m a new parent to be with twins in February 2019. 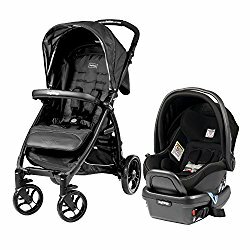 I’m looking for the best duo car seat/stroller combo. Any suggestions would be greatly appreciated. Also the best places or websites to look at for what I’m looking for. Hi Kara, we can recommend 3 different double car seat/stroller combos. If you scroll up on this page, or scroll to the bottom of the right sidebar, you’ll see them. They’re the Graco DuoGlider Click Connect, Baby Trend Sit N Stand, and the Graco Ready2Grow. In each short review, we list advantages and disadvantages of each. Clicking on the “check price” links will take you to the retailer where you can browse through customer reviews and questions/answers. That will give you a good idea of which one will work best for you. Can you buy an extra car seat with the combo for a 2nd car? Hi Teresa, thanks for your question. For the combo itself, it will only be the one stroller and one car seat. But most car seat/stroller combos, the car seat is also sold separately. 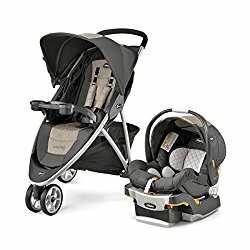 So you could buy a combo like the Chicco Bravo Trio Travel System and then buy a separate KeyFit 30 Infant Car seat to use with another car. Hope that helps! What’s the difference in a three-wheeled and a jogger stroller? Three-wheeled strollers are much like their four-wheeled counterparts in that they are meant for walking, but are more compact and easier to turn in tight spaces. Jogger strollers have a similar slim design and are just as maneuverable, but they have a stronger, more flexible suspension to make riding more comfortable for your child while you’re jogging. They also tend to have fewer bells and whistles since they’re not meant for travel, but rather everyday exercise. The sit and stand seat seems as though it would take up a lot of room when folded up, and with our smaller trunk, I’m not sure it would work. That will depend on the size of your trunk. Some trunks will hold more than they would first appear to be able to. When folded, the sit and stand is about 17 inches tall and 53 inches long, so the best thing to do is measure your trunk space first and then decide if it’s right for you. It can be so overwhelming as a new parent to decided which travel system is the best fit for your lifestyle. We are on our third child and recently did a review of travel systems too. We have decided we love the Britax now, since we are a traveling family and Britax’s no-base installation makes it great for ride sharing. Stroller it is very useful and exciting product. I found your website very interested and informative. Your site article the best blessings, this article is giving properly idea to each and every readers and also it’s giving correct impressions.